The film is about Skoros, a Greek anti-consumerist collective, solidarity/ies, and the joys of doing things differently. 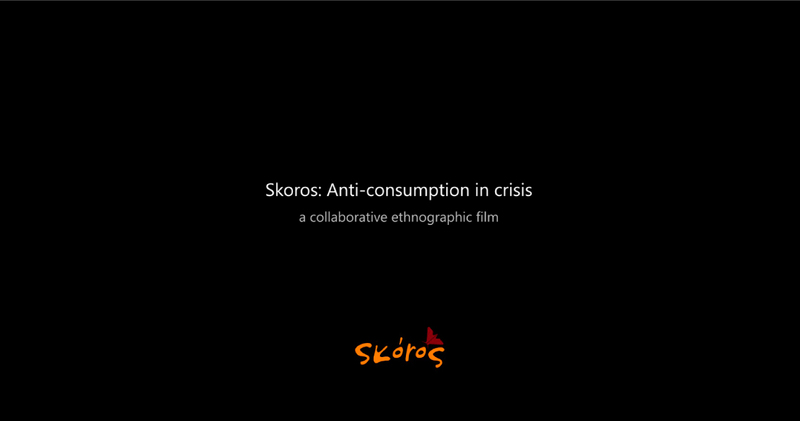 This is an ethnographic film about Skoros, an anti-consumerist collective in Exarcheia, Athens that was established in 2008, right before the beginning of the Crisis. It runs a space where people can come and give, take, or give and take goods and exchange services without any expectations of reciprocity. Originally, Skoros emerged as a response to an increasingly commercialized and consumerist (Athenian) society. It represented an experimentation with doing things differently: by gifting, sharing, and exchanging; and by foregrounding the values of communality, degrowth, solidarity and social justice. A few months after Skoros’ opening I was in Athens for my sabbatical research on forms of consumer-oriented activism and I enthusiastically joined the collective. Back then, it was rather easier to apply conventional critiques of consumerism, not least because Athens appeared conspicuously wealthier, a world-class consumer city. Shopping in super-sized malls and fredoccino-fuelled encounters became cultural norms, not searching for second-hand items or socialising with strangers in grotty-looking places. I remember, for example, observing people that would reluctantly enter, take an item and then insist on donating whatever they considered to be the equivalent market value. Skoros’ idea was too radical for them to grasp. Of course there were also other visitors that refused to entertain the idea of Skoros. As Heracles explains in the documentary, there were those who brought and those who took too many things. Both were a “problem”, the former because they simply wanted to alleviate their middle-class guilt (as is the case in many charity shops); and the latter because they in effect promoted alternative over-consumption. “Limits” soon had to be imposed in respect to the maximum number of items one could both bring and/or take, a containing – yet somewhat contentious – solution. Despite its problems, Skoros proved to be a very popular, and in this sense successful, place. As Nancy puts it, “this is something important that Skoros has achieved. Perhaps because it found itself in this area, in this location, as a neighbourhood shop and not within a squat or a social centre. It opened its doors to the neighbourhood, people walked in. In fact, many of those who came were people who had never done something like this before”. But then came the Crisis, as Zoe explains: “It suddenly dawned upon us: “Resistance? To what exactly? Things are different now”. Put differently, the Crisis imposed a different kind of “here and now”, one focused less on trying to do things differently and more on urgency, a need to provide solidarity to an increasing number of people who were approaching and falling below the poverty line. Skoros’s critique of consumer needs became somewhat redundant. As a leaflet back in December 2011 wrote “…How can we insist that ‘we are not a charity’ when poverty is next to us, around and above us and it is growing massively? How to counterpropose solidarity and community when the crisis isolates individuals and makes them turn against each other?…” More recently, solidarity has also had to be channelled to the thousands of Syrian refugees who have reached the ports of Athens. Throughout the crisis anti-consumption, as originally understood, was no longer relevant; it had to be re-evaluated and redefined. This film is produced and directed almost entirely by members of the collective, in an attempt to narrate the evolution of what seemed to be a rather simple idea. The film is also about the power of people to exercise agency in the face of formidable socio-economic circumstances, it is about solidarity/ies, and the collective joys of doing things differently. Written by Andreas Chatzidakis & Pauline Maclaran. Research: Andreas Chatzidakis, Pauline Maclaran, Alexandros Korpas Prelorentzos. Project Supervision: Andreas Chatzidakis. Shot and directed by Athina Souli. Produced by Zoe Kanelopoulou. Executive producers: Andreas Chatzidakis & Pauline Maclaran. Sound operator: Giorgos Politakis. Edited by Stavros Symeonidis. Music Supervision: Elena Fornaro. Graphics: Lito Valiatza. Intervieweees (in order of appearance): Nancy Palta, Dora Kotsaka, Zoe Kanelopoulou, Elena Fornaro, Vanda Davetta, Heidi Zotika, visitor from Ghana, Lito Valiatza, Lila Kaniari, Babis Kavouras, Iraklis Panagoulis, Alexandros Korpas Prelorentz. A version of this blog was previously published at https://www.opendemocracy.net/can-europe-make-it/andreas-chatzidakis/anti-consumption-in-crisis under a Creative Commons Attribution-NonCommercial 4.0 International licence. Andreas Chatzidakis received his PhD from Nottingham Business School in 2007, focusing on consumer accounts and justifications for not supporting the Fair Trade movement. Since then he has been more broadly interested on the intersection of consumption with ethics and politics, working on projects such as consumer-oriented activism in post 2008 Athens and the role of care and relationality in everyday consumption. His work also explores identity-based and spatial politics in contemporary consumer culture, drawing on disciplines such as human geography and psychoanalysis. He is co-editor of Marketing Theory, senior editor of CITY, and member of the editorial board of Journal of Macromarketing and the newly formed Journal of Consumer Ethics. He has co-edited a book entitled Ethics and Morality in Consumption: Interdisciplinary Perspectives (with Prof Deirdre Shaw and Dr Michal Carrington) and just finished co-authoring a book entitled Contemporary Issues in Marketing (with Prof Liz Parsons and Prof Pauline Maclaran). He is currently co-organising an ESRC sponsored seminar series on Consumer Ethics: Interdisciplinary Perspectives. Tom van Laer discusses his research with Luca Visconti & Stephanie Feiereisen into the need for narrative, finding five motivations for consuming stories varying from Game of Thrones specifically to other books, documentaries and films, to paintings and frescos, to music and novels.